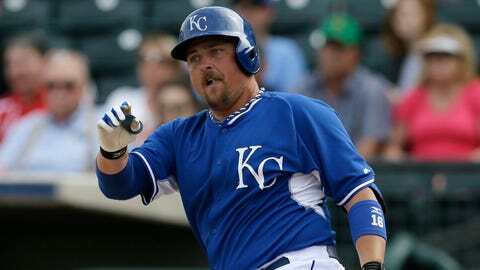 Billy Butler is eager to talk to the Royals about a contract extension whenever they're ready. KANSAS CITY, Mo. 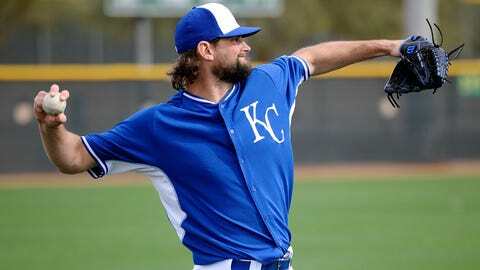 — Billy Butler has said it before and he’ll say it again: He wants to be a Royal forever. How Butler fares this season, and how the Royals fare this season as well, could have a lot to do with that wish. Butler is entering the final year of a four-year, $30 million deal he signed in 2011. The Royals have a club option for next season at $12.5 million, an option they seem likely to exercise, though Butler admits he’d be eager to talk about an extension before then. "No one wants to be playing out their final year, so if something can get done before 2015, that would be great," Butler told FOXSportsKansasCity.com by phone Wednesday. "I’m sure they’ll want to see how things go with me and the club this season before they do anything. "I’m not opposed to doing (contract talks) during the season. But I will say most guys, and I’m in that group, generally don’t like to talk contract during the season. It just gets to be a distraction. But maybe something will happen before this season starts. If not, hopefully it will happen next offseason." Butler, 27, can’t imagine being anything other than a Kansas City Royal. He weathered all the trade rumors this offseason, though club officials have said the team never openly shopped him. And as one club official told me a few weeks ago, "If you trade Billy Butler, the first thing you have to do is go out and find another middle-of-the-order guy who can hit 25 to 30 home runs and drive in 100 to replace him. That doesn’t make sense for us." Nonetheless, Butler is relieved he made it through all the speculation. "I’d hate to not be part of the organization now that we’re this close to being a consistent contender," he said. "We’ve done all this work to get this far, and to not be part of it? I’d just hate that. "So, yeah, I want to be around here a long time. I know baseball is a business and I know guys don’t always stick around with the same team. "But I’ve always said that I want to be a Royal for life. This is the only organization I’ve known. They’ve taken care of me and been good to me since I was 18 years old. I don’t want that to change." It just wouldn’t seem right to not be here. Butler often has spoken about how he admires the fact that George Brett was able to play his entire career in one place — Kansas City. "Kansas City is just a great place," he said. "I love the fans. I love the players here. I love the organization. It just wouldn’t seem right to not be here. But I know there is a business side to all of it, so we’ll just have to see. FOX Sports Kansas City will televise 150 Royals games this season. CLICK HERE for the full telecast schedule. "But yeah, I’d love to get an extension." Butler is more excited about 2014 than any other season since he broke into the big leagues in 2007. "On paper, it just looks really good right now," he said. "But that’s on paper. We have to go out and prove it." Butler expects the Royals will prove it, especially with an offense that should be significantly better than in 2013. The batting order, he says, is as deep as it has ever been in his time with the Royals. "There’s just a really good flow to it right now," he said. "You’ve got (Norichika) Aoki in the leadoff spot and (Omar) Infante hitting second, then Hoz (Eric Hosmer). That’s a great group there to get on base, and hopefully guys like myself and Gordo (Alex Gordon) and Sal (Perez) can drive people in. I expect we will. "The thing is, we have proven guys up there now. Those are guys who know that role and have done it before. Alex did a great job leading off, too, but he’s more of a middle-of-the-order guy. It’s not a situation where we have guys up top that are trying to prove they can do it up there. The guys we have now are guys who already know they can do it." Butler had 82 RBI last season, his lowest total since 2010. But with the improvement up top in the batting order, he says he’s ready for a season similar to 2012, when he had 107 RBI. "I can’t see any reason why I wouldn’t get 100 RBIs this season, with the improvements we made," he said. "There should be plenty of chances."